Isn’t a recruitment event just a jobs fair? Technically, a jobs fair is a recruitment event of sorts in that through them you gain access to qualified and active candidates. However, today we’re talking about events such as Sourcecon and Sourcing Summit Europe which allow talent acquisition experts from all over the world to come together to share their knowledge and experience. So as you can imagine, they’re not quite your average job fair. As we just mentioned recruitment events are often the perfect opportunity for in-house recruiters and hiring managers to learn from the greatest minds in the industry. From technology to the latest trends in hiring, analytics to diversity; if it’s got a recruitment angle, then it’s likely to be on the agenda. And regardless of your recruitment team’s experience in the field, there’s always something new to learn especially when it comes to the latest tech and software. Speakers at these events will not only share their success stories but also the obstacles they faced during their careers and the mistakes that they made. So as you can see, they’re a virtual goldmine of useful industry information that can only help your hiring managers. 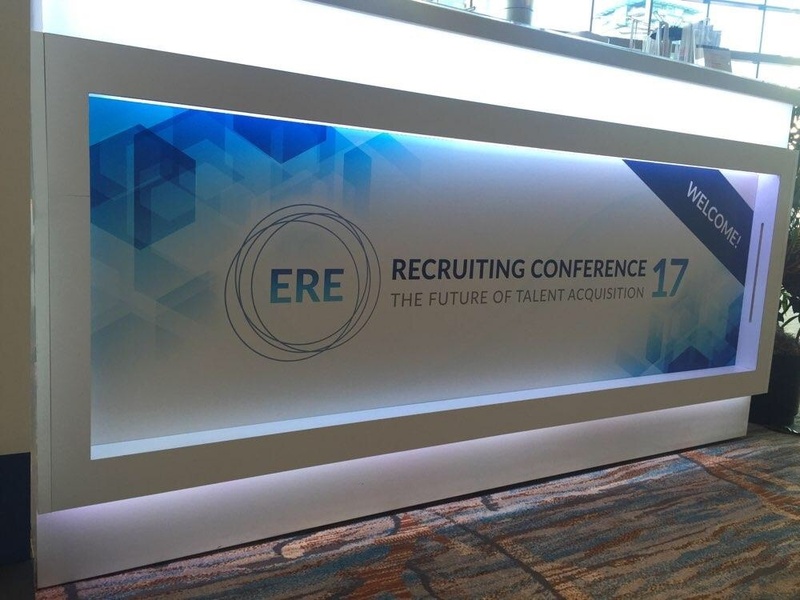 While the knowledge gained from a trip to a large-scale event such as one of the major Sourecon or ERE Recruiting Conferences will undoubtedly help your in-house recruiters improve their chances of success, they also offer a great opportunity to make connections within the industry. As we all know, a solid network can mean the difference between success and failure in any industry. And while many recruiters are often quick to assume this means building a list of candidates, those industry connections can be just as helpful too. Talent sourcing, particularly for high expertise roles, can sometimes mean looking further afield than your local market and that’s when connections made at these events can come in very handy indeed. But it’s not just about the knowledge learned and connections made at these events. This is where your company can really set itself apart from the masses. Recruitment events in 2019 CAN help your strategy - but instead of simply attending the event and being one of the many, take an active role and become one of the standout few. Not only will this help your recruitment team build authority within the industry in a personal light but it’s also an excellent opportunity for doing the same with the company brand. Do you have a rock star recruiter who consistently performs beyond your wildest expectations? Perhaps you have a savvy team member who has helped take your recruitment efforts to the next level through incorporating innovative techniques into your process. Or maybe your hiring manager is an expert on diversity. Whatever expertise your team can offer, there are always others willing to learn from them. Speaking at recruitment events not only highlights the stellar work your team is doing but also shows those in attendance that you are a company that appreciates their efforts. Perhaps some of those in attendance just might jump at the chance to work for you in the future. Not sure where to start? Find some of the biggest talent and recruitment events in 2019 right here. Sponsorship of a recruitment event may sound like an expensive undertaking but trust us when we say that it’s an investment well worth making. And there are two quite significant benefits to sponsorship that could result in a tangible return on that investment. The first is, of course, lead generation. While the attendees at your event may not be the target market that your company has in mind, the advertising for the event will, without doubt, reach some of your ideal customers and clients. But your leads don’t necessarily have to be customers; they could also be recruiters interested in joining your team or other professionals in attendance who may make ideal candidates for future roles. An engaging presentation or talk (we did just mention speaking!) that gives your team the chance to collect emails and contact details could give your candidate pipeline an unexpected boost. The next benefit ties in closely with the first and it’s brand awareness. This is perhaps the biggest benefit of event sponsorship of any kind. Having your company logo associated with a major event helps keep the brand in the mind of attendees. When they see your logo in the future, this association will make them much more likely to take action either as a potential client/customer or as a candidate. Remember though, having your logo on the event advertising material isn’t enough. Your team will need to take an active role at the event, shaking hands with people, handing out memorable swag, and possibly even hosting some activities to encourage conversations. There’s no doubt that recruitment events are that virtual goldmine of information we mentioned earlier but by taking an active role, your company could go one better. Speaking at or sponsoring an event provides you with the perfect opportunity to position your team and company as an authority on a specific aspect of recruitment. Play your cards right, and you could find yourself in the enviable position of having potential candidates contacting you, a dream scenario for many in-house recruiters. Has your company ever taken an active role at a recruitment event? Or are your in-house team too busy hunting for quality candidates to even attend one? If that’s the case, then perhaps we can help. At vsource, we’ve got a thing for building pipelines, and high volume candidate sourcing and our sourcing consultants are always up for a new challenge. With vsource in your corner, your team can start preparing for those big recruitment events of 2019 safe in the knowledge that we’ve got your sourcing covered.